Like a family, the Wolf pack is a social unit. The pack consists of the breeding pair, or parents, called the alphas and their daughters, sons, sisters, and brothers. The alphas are not always the biggest Wolves in the pack, but are generally the toughest and most respected. Wolf packs have from two to an undetermined number of individuals. The average Wolf pack consists of four to seven individuals, with packs having as many as thirty-six members documented, and packs having over fifty members rumored about. In Europe, Wolf packs are smaller, having just three or four Wolves each. 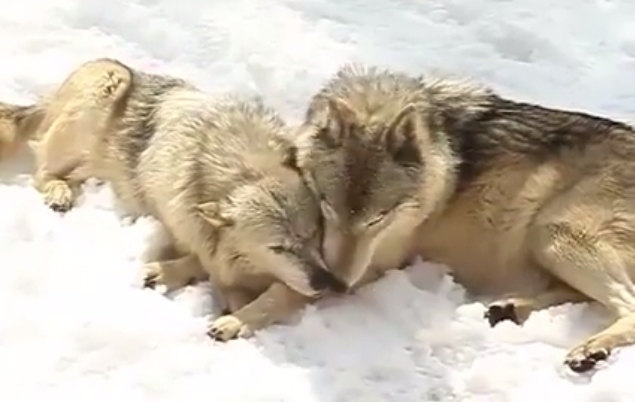 Responses to "Two Wolves Love Each Other So Much They Can't Stop Cuddling"